They are excellent replacement windows in Michigan, if you want a cozier home with better indoor air quality. Casement windows are adjustable and can swing wide open. Once closed, our casement windows will also form a tight seal to keep the weather out. Since Alside windows are durable, you won’t have to worry about cracks, air leaks, and drafts. As one of the leading window companies in Michigan, we recommend our picture windows if ventilation is not a concern. They are not operable, so they are sure to form an airtight seal. This makes picture windows one of the most energy-efficient types available. You can further improve their energy efficiency with Alside’s ClimaTech Insulated glass. This glass reflects heat, so it can keep you cool in summer and warm in winter. Make the most of your home’s great views during your upcoming window replacement in Michigan. Our bay and bow windows can provide a panoramic view of the outdoors, so you can relax and enjoy the sights. They also provide abundant natural light to make your interior brighter and more pleasant. 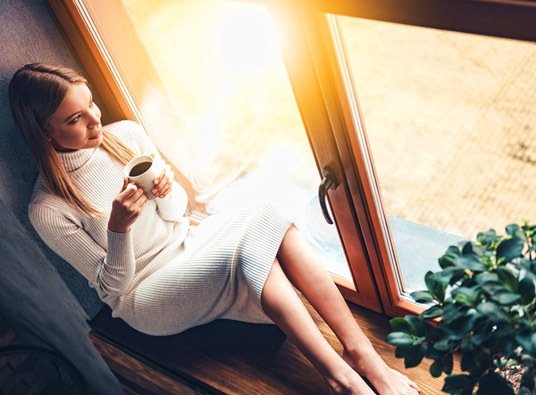 With ClimaTech Insulated glass on your bay or bow windows, you can stay comfortable even when the sun’s out. Alside windows are custom-made to fit your current window openings, preventing drafts and ensuring a stable and comfortable interior. They’ll help make your home a cozier and more pleasant place. Kroll Construction has over 50 years of experience helping homeowners get the best windows for their home. You can depend on us for a stress-free window replacement. Call us at (888) 338-6340 to learn more about our windows. You can also ask for a free in-home consultation.